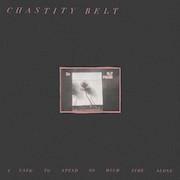 Chastity Belt are amazingly good at exploring the endless ways in which we are trapped: in time, space, gender, social circles. It starts as a teenage thing but it expands (as you know) into adulthood; over the course of three albums, they’ve peered further into the ways we are stuck, hopeless. They do it, though, with style and soft grace, with pealing guitar and lurching bass and lyrics which are at once funny and sad, bleak and friendly. Julia Shapiro, Gretchen Grimm, Annie Truscott and Lydia Lund met a few years ago at college in Walla Walla and are now based in San Francisco. They are a tight gang, women who would stop and put an arm around you if they saw you messed up late at night, vomming in a gutter (yes, you can tell this from their songs). Their albums are getting tighter and warmer too. It is as if they have realised that there are two options - run away or dig dig dig in deeper. And when they dig in, they come up with some really good songs. They are trapped as millennials, skint and self-aware and tedious: “I wanna do something cool and I wanna get paid” (‘Something Else’). They are trapped in their lifestyle: “but I wanna be in the scene, and there's comfort in routine” (‘Complain’). They are trapped in social media habits “if I look at my phone again I'll just die” ('What the Hell'). Most frequently, they are trapped in that tawdry and otherworldly bit at the end of a messy night: “Fucked up, anxious, full of fear, how do I get out of here?” ('This Time of Night'). The disappointing gap between youth and adulthood starts to look like the gap between birth and dying. On ‘Complain’, they do sing about what it’d be like to get out, to give up on life, instead of digging in: “Do you ever dream of what it's like to give up?” But it’s funny as well as sad, and the ace bassline with Shapiro’s resigned voice makes the nightmarish hook - “I’m not okay, I’m not okay” - feel soft and dreamy, and the next line, “I want to complain,” somehow makes it funny. There is joy here, beyond the pleasure of wallowing so elegantly and tunefully in ennui. There’s a jangly whiff of Madchester on ‘Stuck’, and ‘Used To Spend So Much Time Alone’ soars, just a little bit, as Shapiro sings, with laconic reserve: “My doubts are all gone and I'm having a pretty good time.” And there is a powerful sense of a band playing together and touring together and getting bored and scared and stoned and happy together. On final track, ‘5am’, the whole band seems to galvanise, get lighter; everything is still not okay, but the sun is definitely coming up. There’s a rallying, there’s feedback then a stumble and a siren, a quiet emergency.